It's hard to believe that somewhere in the depths of Russia there might be a cave with an 'altar of bones' and a drinking source that provides special recuperative powers, kept so secret that only a single person is allowed to know about it. But casting cynicism aside, this is a giant romp of a book, a great adventure story, where the unlikely heroine wins through, with her newly found boyfriend helping her along the way. The book starts with the death of an old woman in Golden Gate Park, in San Francisco. A strange man is pursuing her, clearly after some information, but Rosie, the old woman is riddled with cancer, and not afraid to die to protect her secret. Then we learn about events many years before in 1939, and about Lena Orlova, a daughter in a line of daughters given the task of guarding the cave. Lena works as a nurse in a prison camp in Siberia, and decides to help one of the inmates, with whom she's fallen in love, to escape. In the midst of a terrible snowstorm she takes him to the cave, breaking her vow not to reveal its location to anyone. As Nikolai seems almost dead by the time they get there, through the deep snow and blizzard conditions, she gives him gruel to revive him, and it clearly has something in it with very strong restorative powers. Then it turns out that Nikolai is not who he seems, and that he was using her to find out where the cave was. As his soldier comrades arrive, they shoot, set off an avalanche and apparently bury Lena in the cave. Back to eighteen months before present day, and a priest, Dom, is sitting with his dying father, Mike O'Malley, in hospital, forced to hear his last story, something about his 'last kill' that he was forced to take part in, and that was filmed by someone called Katya Orlova. Mike then dies, and then a red haired woman wearing stilettos kills Dom, and tries to kill his brother Ry, who is some kind of private bodyguard or gun for hire. Ry is determined to find who killed his brother, and find out what's going on. Finally, we meet the heroine of the story, Zoe, and discover that the old woman in the park was her grandmother, Katya Orlova. Katya discovers that her grandmother has left her a letter telling her about the 'altar of bones', but has no idea what or where it is, or how the clues that her grandmother has left will help her to find it. And suddenly her own life seems to be in danger. Almost 200 pages in and the race for Zoe to find the altar of bones, and stay alive is only part of what happens next. Another 400 or so pages to go, full of side stories as the secrets of a murky past are gradually revealed, and with plenty of twists and turns along the way. The book has a complex plot that drives the plot forward at great speed, making the 600+ pages an easy read. There are a few trivial mistakes (use of the word mitochondrials instead of mitochondria in a mortuary scene), that are a minor irritation, but other 'science' bits are a bit more convincing. Overall, I really enjoyed this book. A bit daft in places, but an immersing read all the same. 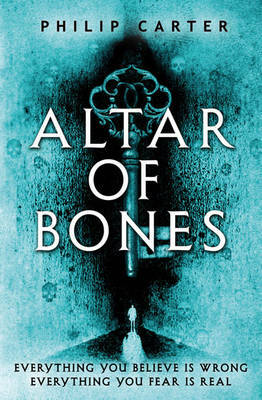 Read another review of ALTAR OF BONES.